Here's yet another layout for a challenge, this time for Once Upon a ...Sketch. Can you believe how many great challenge blogs there are out there? It's perfect, if you suddenly feel the need to kickstart your creativity after a longer period of not scrapping, for one reason or another. 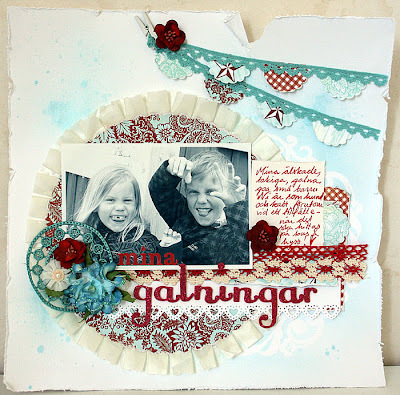 This layout is made with a photo of my kids. The journaling criteria was to write who the person on the photo is and at least one fact about them. These are my kids, and I've written about how much they fight and argue all the time, and the only thing that can bring them together and make them agree is when it's goofing around time, or being up to some sort of mischief. love it, the phot, the details, just perfect! This is absolutely gorgeous Jenny! SO totally beautiful. Your work is amazing! Thank you for sharing this beautiful work with us at OUAS! Wow! I love, love, love this! Your banner is so pretty and the trim around the circle is lovely. I like the torn paper as well...perfect! I adore this layout...I love everything about it especially the little details I love the banner with the peg just so creative!!! I love the colours the photo...fabulous take on the sketch!! Thanks for playing with us at Once Upon A...Sketch!! This is gorgeous! What a fun photo, I love the colors you choose and all the beautiful trim! this is fabulous! i love the colors! cheeky photo too! Hej Jenny denna var just helt underbar. Man skrattar åt det kula fotot och slås av alla de vackra detaljerna du fått med. I love this layout, it is stunning.